Estadio El Sadar, previously also known as Estadio Reyno de Navarra, replaced Osasuna’s old Campo de San Juan. El Sadar opened on 2 September 1967 with a three-team tournament involving Osasuna, Real Zaragoza, and Portuguese side Vitoria de Setúbal. The stadium could initially hold about 25,000 spectators, of which 7,000 seated, but it got further expanded in 1989 when a new main stand was built. Soon after however, capacity was reduced again to 20,000 when the stadium got converted into an all-seater. In 2005, Estadio El Sadar changed names to Estadio Reyno de Navarra in return for financial support that the club had received from the city of Pamplona. Reyno de Navarro was the brand used to promote tourism in the Navarra region. The stadium reverted back to its original name in 2013. Estadio El Sadar is located on the southern edge of Pamplona at about 2.5 kilometres from Pamplona’s city centre and 4 kilometres from the rail station. The walk from Pamplona’s city centre takes about 30 minutes, but you can also use bus 11 to get to the stadium. Take the bus from Plaza Pincipe de Viana in the direction of Cordevilla or Parque Comercial Galaria. Get off at Sadar, which is right in front of the stadium. From the rail station take bus 16. Take the bus in the direction of Beriain Pza Larre and get off at Zaragoza 84, from where it is a short walk to the stadium. Buses leave at least every half an hour. It is a 20-minute ride from the centre and 5 minutes more from the train station. Estadio El Sadar is located on the edge of the city in an area that is mainly composed of modern apartment blocks. There is little in terms of entertainment in the immediate area, though there is a retail park with a few fast food outlets a 15-minute walk south of the stadium. Apart from that, eating and drinking is best done in Pamplona’s city centre. In the same area south of the stadium you can find Hotel Zenit, and not too far away Hotel Bed4U. Both get good reviews, but are most of all convenient for those arriving by car. Click here for an overview of all hotels near Estadio El Sadar. Alternatively, there is a reasonable selection of hotels in different price categories in the city centre of Pamplona. Tickets for Osasuna games can be bought at the ticket booths of El Sadar on the day before the match and the day of the match. 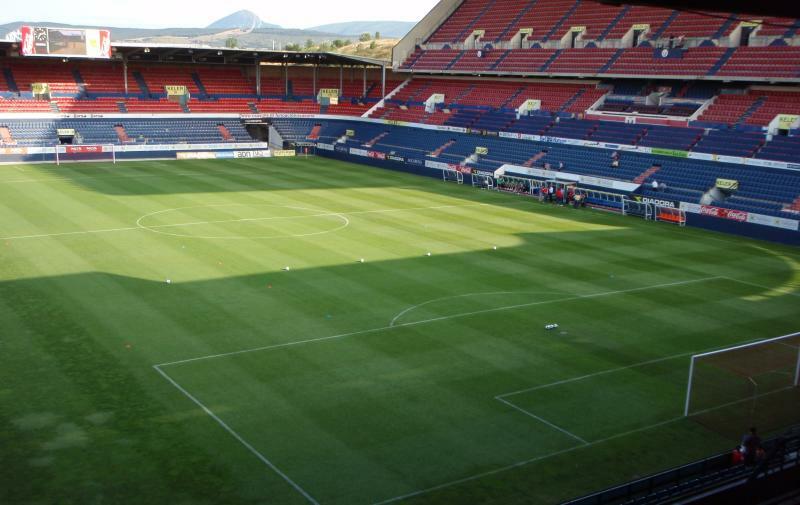 Osasuna don’t normally sell out, but buying in advance is recommended for local derbies or other high-profile matches. Ticket prices typically range from €30.00 for the upper parts of the main stand to €65.00 of the central parts of the main stand. Osasuna.es – Official website of CA Osasuna. Turismodepamplona.es – Official tourism website of the Pamplona city council. Infotus.es – Osasuna public transport information. MCP.es – Osasuna public transport journey planner. nice stadium and quite like an old English type in that the fans are near to the pitch. we went see the match v lavante so it wasn’t high profile the tickets were 35 euros and were great seats opposite the main stand, there were touts selling tickets right next to the box office and were complimentary seats priced at 25 euros each, there didn’t seem to be anything against the law but be careful to make sure that the tickets are next to each other. nice friendly fans and very passionate. i went in October and it was very warm. as is usual with la liga no beer at half time and didn’t see any bars local. i stayed in the old town in the pension bearan, excellent at 25 euros a night for a twin room with balcony.